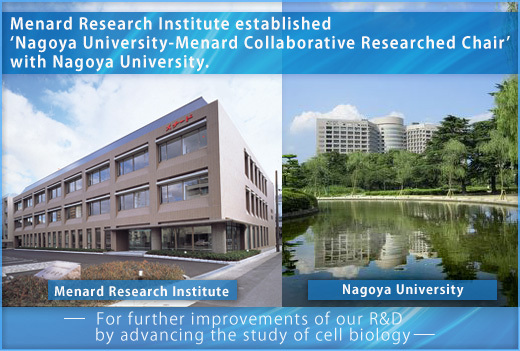 In May 2013, Nippon Menard Cosmetic established 'Nagoya University-Menard Collaborative Researched Chair' out of industry-university collaboration with Nagoya University Graduate School of Medicine. Menard Research Institute has been conducting comprehensive life science research including the studies in dermatology and health science. Researches on the mechanism of aging and pigmentation are a few examples out of many investigations, which are applied to product developments. In this chair, we will utilize the latest research techniques, facilities and equipments of Nagoya University to further improve our research and development by advancing the study of cell biology such as the progression of stem cell research we have been working on. Throughout this collaboration, we will strive for the development of epoch-making healthcare products which contributes not only in the field of cosmetics but in the medical-related area.